Shortly before the dedication of the Memorial in July 2011, the Committee were delighted to receive copies of the photographs shown below. 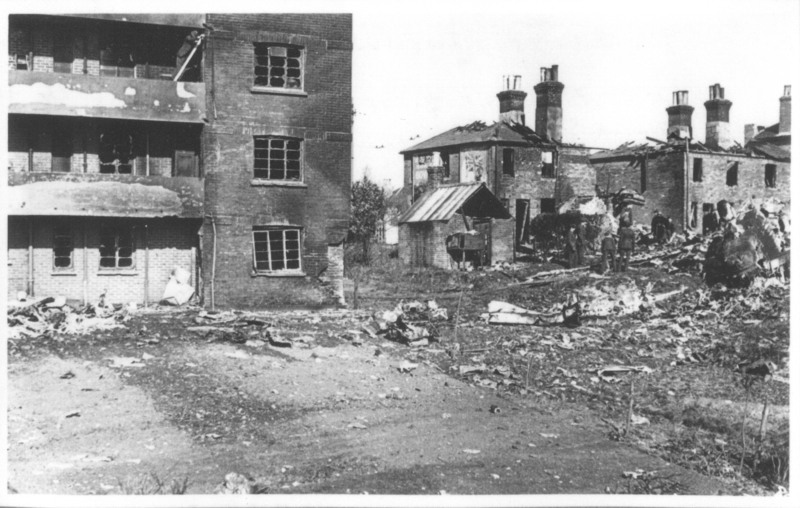 These excellent quality photos were received from John Cresswell, of the Bournemouth Natural Science Society, and were taken from the collection of Alderman Harry Mears, who had been Civil Defence Controller for Bournemouth, during the war years. 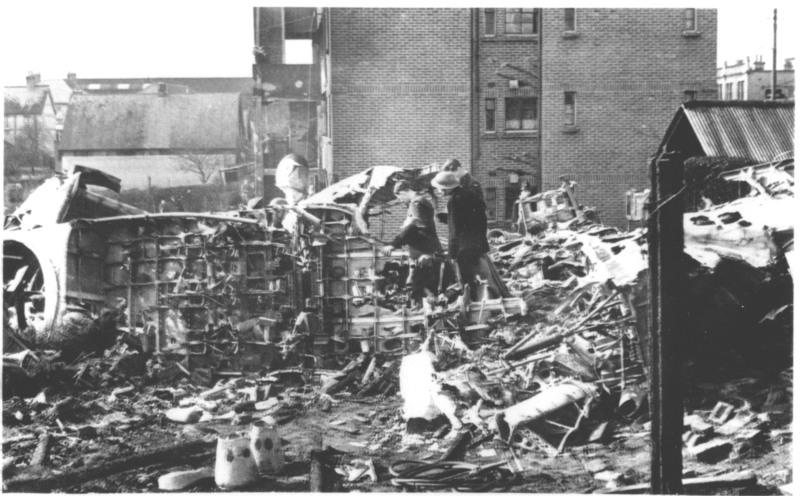 Until then, it had generally been assumed that the only photographs of the crash scene were those published in local newpapers around the time of the crash, so it was very rewarding to discover that these excellent quality photographs had also survived. It is believed they are 'official' Civil Defence records, from the day after the crash. Our thanks are to John Cresswell, for these valuable additions to the Memorial documentation. 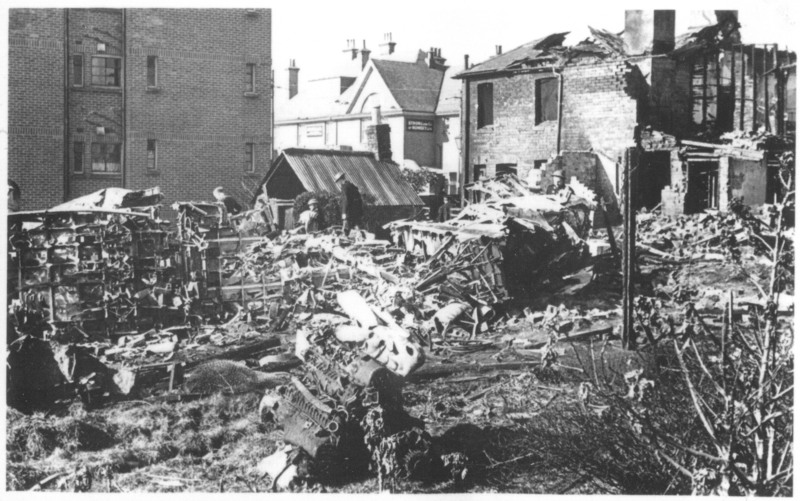 This first image shows the inverted wreckage of the aircraft fuselage, behind the burnt out cottages at 1025-1031 Wimborne Rd. As you can see, there wasn't much left intact, after the devastating fire that followed the crash. 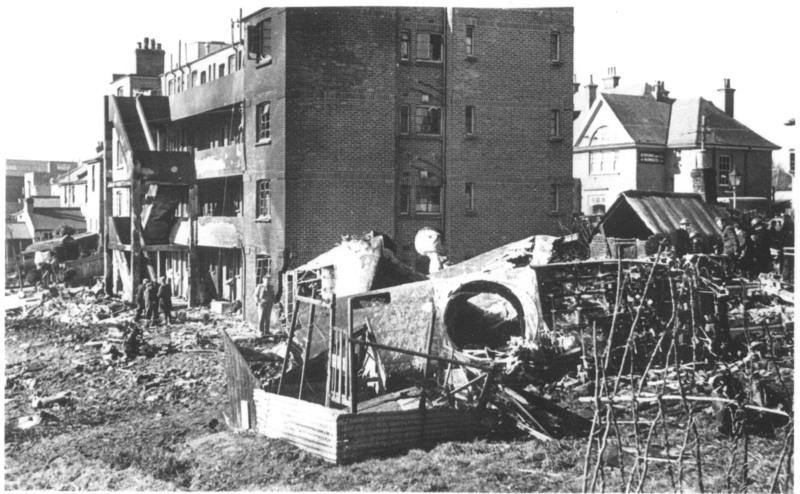 This next image shows some of the wreckage, looking back towards the rear of Meadow Court, with the Holly Tree (then called 'The Hollies') public house in the background. This photo shows the wreckage of the port wing, torn off in the impact, behind Meadow Court. This shows the damage to the end of Meadow Court. The corner ground floor flat, no. 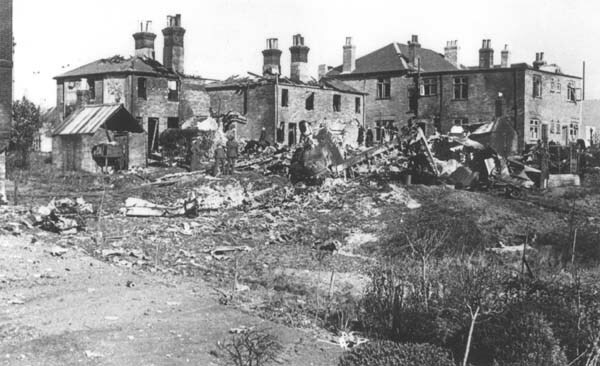 9, was where Mrs. Bennett lost her life. This is a closer view of the rear of the burnt out cottages. Mr. Chislett lost his life in the back bedroom of No.1027. You can see that the end part of the building has been removed, to allow the authorities to retrieve his body. Clearly in a dangerous condition, both semi-detached cottages were demolished shortly afterwards. 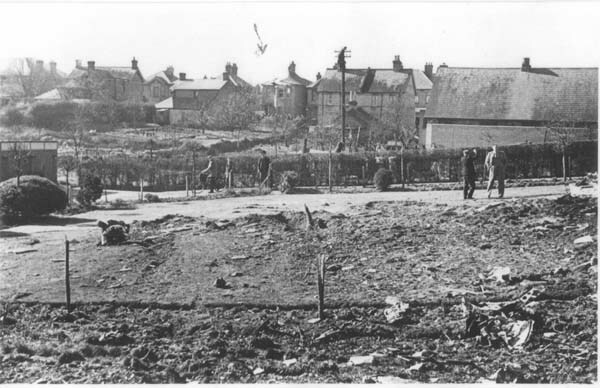 Another view looking back towards Meadow Court, and across Wimborne Rd, showing more detail of the wrecked aircraft. This view shows the top edge of the bus depot roof in the distance. 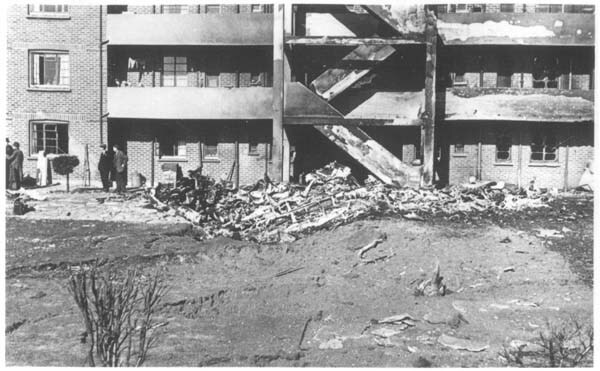 It is believed the aircraft clipped this building, shortly before the final crash. This view is looking back towards Malvern Rd, showing the debris strewn furrow created by the crashing aircraft. You will notice an arrow, pointing downwards, at the top of the picture. This points towards the damaged gable end of No. 13 Malvern Rd. It was at first thought that the aircraft had struck this house just before the final impact, but it now seems more likely that the aircraft struck the bus depot roof, and that it was debris from that collision which damaged the house. 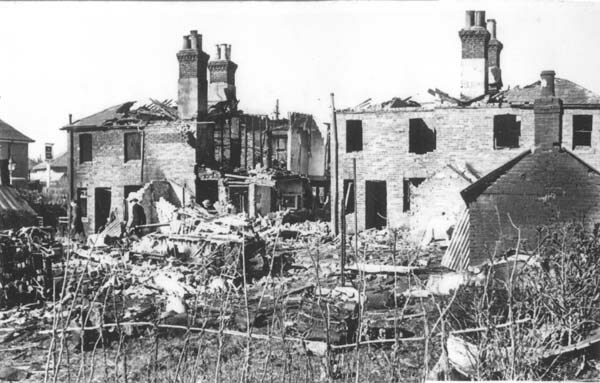 Fortunately, Mr. and Mrs.Cooke, the occupants of No.13 at that time, escaped injury. 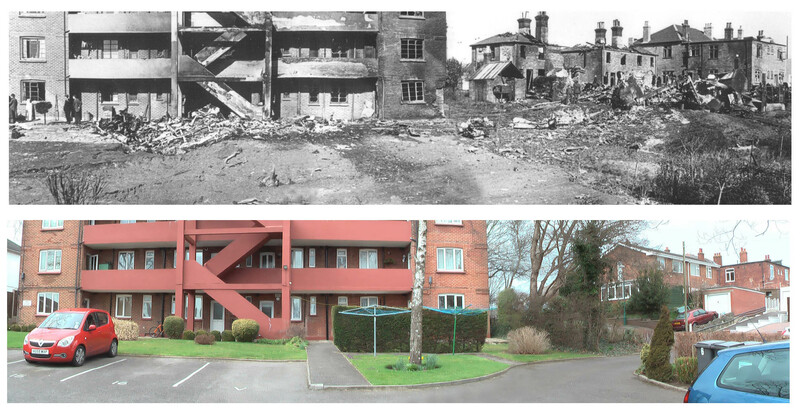 These images from behind Meadow Court shows a panoramic view of the crash scene, taken from some of the above photos, together with the view as it appears today. You can click on the image for a higher resolution version.